ATELIER *mati* is a website that you can download many crochet patterns for free! 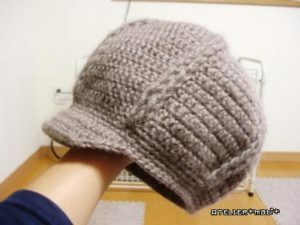 This simple cap is crocheted using bulky mohair yarn. It also suitable cotton yarn for summer. worked in continuous rounds. DO NOT turn at the end of a round. Ch6 sl st in first ch to form ring. Round 2 : ch3(count as dc), 1dc in same st, 2dc in next dc and in each dc, join with sl st in top of ch3. (30dc). Round10 : ch3(count as dc), FPdc in each FPdc and dc in each dc around, join with sl st in top of ch3. Round18 : ch1(do not count as sc), sc2tog in each 2FPdc, sc in each dc, join with sl st in first sc. Row5 : ch1(do not count as sc), sc all around the edge with 2sc in corner. I’m living in Japan and a mother of 10-year-old girl with crochet addiction. My website in Japanese is atelier-mati.com/. © 2017 free crochet patterns ATELIER *mati*.